Home > News > News > Strike it Rich in Cirque Mechanics – Boom Town!! Strike it Rich in Cirque Mechanics – Boom Town!! Come join our wild west adventure in Boom Town! Journey along as Cirque Mechanics – Boom Town transports us to the 1860’s small frontier town of Rosebud, where two ambitious saloon owners have set up shop in the hopes of cashing in on the town’s gold rush frenzy. The circus that ensues when they begin to feud for the townsfolk patronage, leads to a series of explosive events, exciting brawls, an unexpected romance and a lucrative discovery. Boom Town takes you beyond the town and deep into the mine to join in the excitement of exploration and experience the thrill of discovery. You’ll be inspired to pick up your picks and pans, hop in an ore cart and come along for the ride! 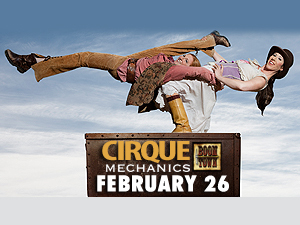 Cirque Mechanics – Boom Town pulls into town on Saturday, February 26 with shows at 3:00 and 8:00 p.m. Purchase your tickets now and be a part of a series of hilarious and unexpected events full of the lore, excitement and adventure of the old west!